15% Off Orders at Blacks Stock up on all your essential just in time for your next trip, and save 15% on your order with this Blacks voucher code. 15% Off Selected Camping Orders at Blacks Get all your camping essentials today, and save 15% on your order with this Blacks voucher code. Up to 80% Off Selected Men's T-Shirts at Blacks Take advantage of the January sale at Blacks, and save up to 80% on your order. Up to 70% Off Women's Collection at Blacks With 70% off your order, Blacks is the perfect place to freshen your look up. Up to 50% Off Camping Items at Blacks Get prepared for your next trip, and save up to 50% on your camping essentials. Up to 50% Off Equipment at Blacks Get some new outdoor equipment at Blacks, and save up to 50% in the mid-season sale. Free Click and Collect on Orders Over £30 at Blacks If you aren't going to be home to receive your order, why not get it delivered to your local store for free? Up to 65% Off Kids Clothing at Blacks Get your little one outdoor ready and save up to 65% on outdoor clothing. Blacks is a truly historic fixture in British retail, and was first created as a nautical products company in 1861, by Thomas Black, whose name remains a big part of the brand. Thomas Black began selling sailing equipment before branching out to cover all kinds of other outdoor activities, and as people began to travel more in the 20th century, skiing and other winter sports became popular pursuits for the adventurous! Now Blacks is a real go-to store for those who are passionate about all kinds of exciting outdoor activities. Blacks caters for the whole family with a catalogue rich in protective gear, innovative clothing and functional footwear for men, women and kids. For the hikers, commuters, happy campers, skiers and more - Blacks offers big name brands at great prices, so you can always save on the goods that you need to make your everyday experiences even more memorable. Shop renowned names like Eurohike, Jack Wolfskin, Lowe Alpine and more - whether you want to shop by activity like travel, run and ski or in the collection dedicated to camping - you will find nothing but quality goods to support you in your adventures - so now you can really take yourself to new heights with Blacks. Browse the blog to find reviews and information on a world of technical outdoor equipment that can be purchased too. From climbing and ski equipment to outdoor cooking products and even GPS navigation systems designed for hikers and explorers - this is your ticket to becoming a pro in your favourite activities. With outdoor tips, ideas and more, this is how you can make the most of your lifestyle - whatever the season. How do I use my Blacks discount code? All other discounts will be given automatically when you choose the applicable items at Blacks. Blacks has a Last Chance To Buy section where you can find clearance products at heavily reduced prices. These are the same great products you'll find everywhere else on the Blacks' site, but may be out of season or from old lines. You can save a huge amount on premium quality equipment and clothing by keeping an eye out for products you need in this part of the Blacks site. Does Blacks offer student discount? Students can get 10% student discount at Blacks with a valid Student Beans iD. Does Blacks offer free delivery? Delivery is free on orders over £70, otherwise, the cheapest shipping option is Click & Collect for £1. Where is my closest Blacks branch? Use the store locator to find your closest Blacks to shop in person or use the Click & Collect service for online orders. If you'd like any further information on Black's delivery options, take a look here. You may return your goods for a refund or exchange within 28 days of delivery. Click here for full details of the return policy. Tel: 0161 3937059 or use the online chat. If you’re looking to stock up on outdoor gear for those summer expeditions - including clothing and equipment for men, women and kids - think Blacks. Stocking leading names in sports' and outdoor gear, here you’ll find all the products and accessories you need. Save with a Blacks discount code and don’t wait to plan your next adventure! Get into the outdoors as the days lengthen and the sun shines with camping and hiking gear, running shoes and beyond. You'll find a wealth of choice from names you can trust at Blacks. 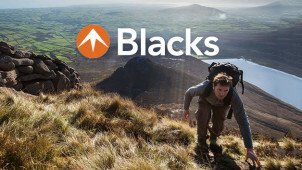 Blacks has its very own app, designed to let you connect with the outdoors, wherever you may be! Tap in anywhere and this is breezy shopping for all of your outdoor goods. Easily connecting you to the stores, should you need a last minute tent when you're en route to the peaks, or a waterproof jacket while you're visiting a friend in the north - you'll be able to sort yourself out easily with the Blacks app. Check out Blacks' footwear selection for men, women and kids for all types of outdoor shoes. From hiking boots to wellies, and from running shoes to snow boots - use a Blacks voucher code and you can find attractive styles with both high-quality design and practicality to keep you going on your summer hike, run, cycling trip and beyond. With goods from excellent brands like Salomon, Berghaus and The North Face, as well as Blacks' own product lines, you'll find what you need in comfort and style with Blacks.